The Games this year have been spectacularly entertaining. The gaze of the world has been fixed on the sporting excellence and impressive abilities of more than 11,000 athletes from 205 countries, competing in 42 different sports. It’s been a feast of nail-biting action, somehow truly loved by sports fans and the less sportingly-inclined alike. We’ve witnessed memorable moments: 19 year-old Simone Biles conquering gymnastics and winning four gold medals; Rose Nathike Lokonyen carrying the flag for the Refugee Olympic Team into Macarana; Team GB doing better than ever, placing second on the medals table with 27 golds and 67 overall; Kohei Uchimura’s mum fainting at his victory; the pleasure of seeing Bolt sprint ludicrously fast, which never gets old; and, of course, watching the celebrations of athletes and coaches when the years of hard work pay off, big time. My favourite of these victory moments was Japanese wrestler Risako Kawai, who celebrated her gold medal triumph by slamming her laughing coach down on the mat twice, before parading him around the arena on her shoulders. Look it up. The Olympics have a way of uniting unlikely pairings, and bringing out a national competitive streak you didn’t even know you had. But one aspect of Rio 2016 which hasn’t represented the peak of human progress so far has been some people’s attitude towards female Olympians, who have suffered somewhat more than the male athletes this year, at times even treated in disgracefully out-dated, sexist ways. 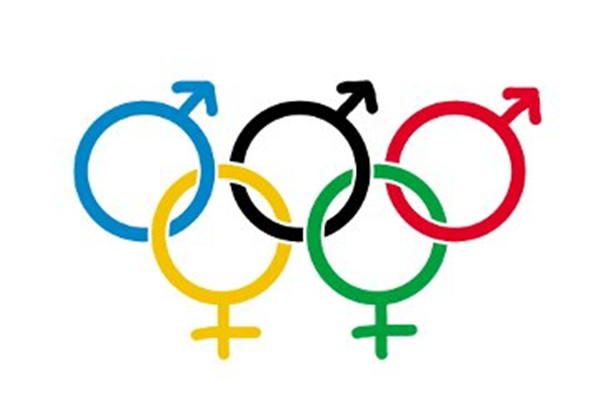 The outraged public took to social media to call out instances of unequal treatment and to vent its frustration that female athletes are still not getting the respect their hard work and astounding achievements deserve. Let’s take a look at some of those sexist bulls**t moments that provoked shock and disgust from the online community. I can’t bring myself to rank these major blunders, so, in no particular order, here they are. You might remember Inverdale from a couple of years ago when he wondered whether Marion Bartoli’s father had told her when she was young that she should be 'a scrap', as she was ‘never going to be a looker’, like Sharapova. This was just after she won Wimbledon 2013. He later sort of apologised, but blamed his slur on his hay fever, which I heard makes you sneezy, not sexist. This moment came just after the world was knocked off its feet by Simone Biles’ routine on the beam, and the athletes were waiting for the scores. Seeing this team of world-class sportswomen gathered together, an NBC commentator couldn’t help but be reminded of a familiar sight, and commented that the Final Five ‘might as well be standing in the middle of a mall.’ Oh dear. Twitter did not like that. The Internet reacted with outrage when one male viewer decided to tweet his cycling tips to Dutch Olympic cyclist Annemiek van Vleuten. Condescending, much? The Chicago Tribune’s congratulations post was not received well, mainly because it referred to Olympic medal-winning shooter Corey Cogdell as ‘Wife of a Bears lineman’. Will a woman ever be able to achieve without the media focusing on her man? Or how when Hungarian powerhouse swimmer Katinka Hosszu won gold in the 400-meter individual medley, smashing the world record? Cue NBC camera to pan to husband/coach: ‘And there’s the man responsible.’ What an embarrassment. Swimming champ Katie Ledecky is awesome in her own right. Sadly, coverage of her amazing world-record-breaking victory was overshadowed by news of Phelps’ tie at a silver. We understand that Phelps is a big name, and might sell a few more papers, but this is a shameless under-celebration of female achievement. However, Ledecky can be grateful that major networks focused on her sporting achievements, right? Wrong. 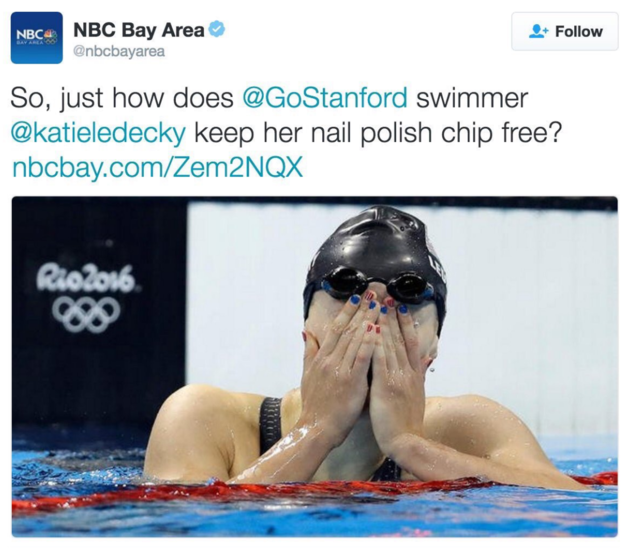 They were amazed by the swimmer’s nail care abilities, instead. The offending NBC tweet. Deleted, but not quickly enough. Majlinda Kelmendi won gold in the judo final, scoring Kosovo’s first ever medal in the Olympic Games. No-one could possibly take away from this history-making achievement. Except that a BBC presenter referred to the incredibly technical sporting event as a ‘catfight’. Never mind that this is a massive moment for this athlete and her country, which was only admitted by the IOC in 2014, having declared independence from Serbia 8 years ago. Now now, that’s not nearly as important as the entertainment value of two women fighting, right? I will stop before my blood actually boils. I know the list goes on far further, but I’d love to hear in the comments section if I missed the moment that made your skin crawl the most.